Many state health policy leaders are interested in telehealth—the use of technology to deliver health care to patients in a setting different from that of the provider—as a way of expanding patient access to care, especially in rural areas. State health policy leaders have been looking at ways to expand and clarify telehealth reimbursement policies, especially as they relate to private payers. Since 2010, there has been nearly triple the number of states that have enacted legislation related to telehealth. These laws range in scope and features. Many contain limiting factors, such as the language used in the law; whether there is payment parity between a service provided via telehealth or in person; the type of telehealth modality used; location of service; and type of provider who can offer the service. 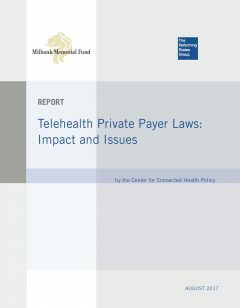 To get a better understanding and to assess the impact of these laws on telehealth utilization, the Reforming States Group asked the Center for Connected Health Policy to write a report examining the response of selected commercial payers to telehealth private payer laws. It is our hope that this report will help leaders and decision makers develop policies that promote the appropriate utilization of telehealth modalities and expand access to care for the populations they serve.